The top-ranked Shawnee Mission East Lancers will take on the unbeaten Shawnee Mission West Vikings in a key game in the Sunflower League and on the eastern half of Class 6A. The Lancers and Vikings are two of the remaining four teams without a loss in Sunflower League play (Lawrence and Olathe North). This will be a home game for the Vikings who play at Shawnee Mission South High School. Defending champion Shawnee Mission East opened with shutout victories over Gardner-Edgerton (45-0) and Shawnee Mission South (49-0) before beating Shawnee Mission Northwest 44-20 last week. The Lancers raced out to a 44-7 lead at halftime in cruising to victory over the Cougars. East features many different weapons on offense under Dustin Delaney, and last week was no different. Jack Tyler and Mike Bamford each scored a pair of touchdowns for the Lancers, while quarterback Luke Kaiser hit Sky Tate for another long score. Kaiser directs the flexbone offense, taking over for the graduated Gunnar Englund. The junior leads East with 314 rushing yards and has thrown for 311 yards and three scores. In the backfield, the Lancers still feature 2014 all-state selection Wyatt Edmisten, but compliment him with the likes of Bamford, Tyler, Eli Kurlbaum, and Cal Jones. Edmisten has 143 rushing yards and two touchdowns, while Bamford (280 yards, 5TDs), Tyler (154 yards, 4TDs), Jones (154 yards, TD), and Kurlbaum (86 yards) all share carries behind an experienced offensive line. Tate has proved to be the East deep threat thus far with nine receptions for 275 yards and five touchdowns. On defense, 6-foot-4, 248-pound defensive end Luke Heisdorffer is a force having already logged seven tackles for loss. Shawnee Mission West is 3-0 after hard-fought victories over Lawrence Free State (34-26) and Olathe Northwest (20-12). The Vikings trailed Olathe Northwest 12-0 at halftime in Week 2 when storms forced that Thursday night game to be postponed until the next day. West came out with a new focus and scored 20 points to get the win. The Viking defense limited the Ravens to just 25 yards of total offense in the second half of that game. Last week, West rolled to a 48-7 victory over Shawnee Mission North. The Viking offense is directed by senior quarterback Adam Rellihan. Rellihan (6-3, 180) has been the Viking signal caller for the better part of two seasons now. Last season, he passed for more than 400 yards and four touchdowns, while rushing for four more scores. Through three games this season, Rellihan has matches his four rushing touchdowns and improved his completion percentage to 57 percent. He has passed for 272 yards and one score. Senior Rahjee Byers and junior Nigil Houston have each rushed for 295 yards through the first three games. Houston has done so on just 25 carries, an average of 11.8 per tote, and has scored three touchdowns. Byers averages 5.4 yards per carry and has scored twice. When the Vikings look to the air, Rellihan will seek Isreal Watson who has nine receptions for 206 yards and a score. Last season East won 42-19 in the regular season behind 430 rushing yards and big games from Edmisten and Englund. The Lancer and Vikings met again in the 6A quarterfinals where East won 41-0. Derby fell 27-20 at Class 5A No. 1 Mill Valley in a great high school contest last Friday. The Panthers had chances to at least tie in the final seconds, but three passes fell incomplete and a quarterback rush on fourth down ended the threat. Senior Brady Rust helped Derby hold a 402-317 yardage edge, but the Panthers failed to convert a fake punt and threw two interceptions. Meanwhile, Mill Valley kicked two field goals and returned an interception for a score. In addition to Rust at quarterback, Derby features standout running back Garrett Xanders and multi-purpose threat Kai Lemons. Xanders rushed for 50 yards last week, while Lemons had one catch, for 85 yards. Hutchinson has continued to play well after last season's second-half surge to the Class 6A state title game. The Salthawks rushed for 398 of their 399 total yards in a 37-14 victory against Salina South last week to improve to 3-0 for the first time since 2009. Hutchinson has outscored its 2015 opponents 139-35, while Derby holds a 116-67 margin. Last season, Hutch started 1-3 and had scored just 85 points after the first four weeks in the season. Junior Josh Rivas and senior Austin Fletcher have anchored an offensive line that has helped the Salthawks average 341 yards rushing per game. The Salthawks returned very little at the skill positions from a year ago, and several backs have shared carries. Tracy Harris rushed for 118 yards on just seven attempts last week. Derby kept Mill Valley's rushing attack in relative check (31 carries for 140 yards), though the Salthawk rushing offense is one of the state's best. This has been one of the premier matchups in Kansas in recent years. Derby captured the regular season contest by a 35-28 score last season before Hutchinson won by the same margin in the playoffs. 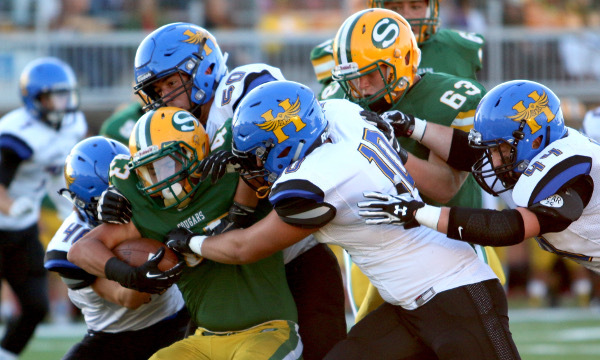 Hutchinson and its rushing attack will deliver the victory on Friday. It seems as if each week brings another ranked showdown featuring Eastern Kansas League teams. This week’s marquee game is St. Thomas Aquinas at Bishop Miege. Aquinas posted back-to-back 42-13 victories over Blue Valley North and Blue Valley Northwest after the season-opening loss against top-ranked Mill Valley. The Saints are extremely talented and received a boost last week with the return of an all-state caliber running back in James Cosentino. Cosentino hadn’t played since suffering a broken leg in a Week 9 loss to Pittsburg last season. As a junior last fall, Cosentino rushed for 1,296 yards and 14 touchdowns and was named an all-state return specialist. Karter Odermann continues to direct the Saints offense. Last season Odermann rushed for 1,074 yards and 13 touchdowns while passing for 795 yards and ten more scores. Sam Ramaekers, Duron Lowe, Jacob Leikam, and Sam Budetti all contribute to the Saints ground attack. Ramaekers and Leikam have received the bulk of the carries thus far along with Odermann, but the speedy Lowe is a big-play threat. Bishop Miege will likely be without one of its best playmakers in all-state running back Dawson Downing. Downing suffered a hand injury in a Week 2 win over Gardner-Edgerton that may cause him to miss a few weeks. After rushing for 1,955 yards and 31 touchdowns as a junior last season he has 283 yards and six touchdowns in a little over one game this season. Senior T. J. Goodwin and sophomore Cameron Clark have filled in for Downing and combined for four rushing touchdowns. Goodwin has 150 yards on the ground, while Clark has 199 yards on just 12 carries. Sophomore quarterback Carter Putz has picked up the slack for the offense in completing 68 percent of his passes for 897 yards and ten touchdowns in his first three games. Putz passed for 352 yards and four touchdowns in last week’s 42-35 loss to Blue Valley. Miege is loaded with talented receivers led by junior Jafar Armstrong who has 19 receptions for 411 yards and four scores. Tight end Nolan Gray has 13 catches for 211 yards and two touchdowns. Last season, Miege jumped out to a three-score lead before the Saints pulled within ten points on two different occasions. Miege eventually won 37-20. Miege gave up more than 400 yards rushing in the loss to Blue Valley last week, and the Stags will likely get tested on the ground again against Aquinas. The question will be is if Miege has enough firepower to outscore the Saints? The second of three huge games that will decide the Great West Activities Conference (GWAC) occurs this week. Ulysses got a leg up on the league race with a 34-20 victory versus Holcomb last Friday. The Tigers have heavily used standout running back Ian Rudzik for four years now, but took it to a new extreme early in the game on Friday. The Tigers lined up Rudzik in the Wildcat and continued to direct snap him the ball on the first drive. Ulysses led 14-0 after the first quarter and 27-20 after three quarters. Holcomb had a sizable edge in plays (64 to 49) and both teams finished with 17 first downs. Holcomb finished with 363 yards, but Ulysses had 478, mainly because of another incredible game from Rudzik. He carried 27 times for 320 yards and three scores and finished with 12 tackles, three for loss. Holcomb senior quarterback Trey Teeter had a solid game with 19 of 35 for 243 yards with two scores against no interceptions. Not especially known for his legs, Teeter collected 14 carries for 71 yards and a touchdown. Scott City has had to retool at many positions, but its traditionally great defense has permitted just 35 points during their 3-0 start. On offense, the Beavers are run-heavy behind standout seniors Cooper Griffith and Wyatt Kropp. Griffith has cleared 100 yards in each game and has 47 carries for 375 yards and five scores. Kropp has 41 carries for 189 yards and three touchdowns. Junior Bo Hess, in his first season as the starting quarterback, has completed 22 of 47 passes for 324 yards with four touchdowns and four interceptions. Scott City has seven turnovers and is minus-1 in turnover margin; the Beavers had 10 turnovers all last season and were plus-28. On the defensive side of the ball, senior Abe Wiebe has paced Scott City with 33 tackles and is tied with Griffith for the team lead with six TFLs. Scott City has won 11 of the last 12 in the series with the lone loss a 13-12 defeat in 2007. The greatest concern for Holcomb last week wasn't that it couldn't move the ball hold on to it. The issue was Rudzik, arguably one of the state’s top players. Scott City is very talented, but Holcomb is better all-around, especially more experienced at quarterback. Holcomb’s experience delivers the victory. One of the state’s longest-standing rivalries continues at Hubbard Stadium in Smith Center on Friday night. Smith Center, unranked to start the season, has risen to No. 4 in Class 2-1A, building on an inexperienced 2014 squad that finished 5-4. The Redmen have tallied 121 points, third-best in the classification, and held Thomas More Prep to under 40 total yards in a shutout last week. Norton, one of 3A’s top squads, owns a 7-6 road victory against Phillipsburg in Week 2. Last week, the Bluejays were scoreless at halftime versus Oakley before pulling away for a 27-7 victory. Norton’s offense has struggled since it lost all-purpose threat Gavin Lively to a significant knee injury late in the second quarter of the Week 2 victory over Phillipsburg. The Bluejays had just 188 total yards and eight first downs against an Oakley team that fell 35-0 to Smith Center in Week 2. Sophomore quarterback Jace Ruder threw a pair of touchdown passes to ignite the Bluejay offense. Ruder is 7-0 all-time as a starter and suffered a season-ending collarbone injury in this contest last year. Norton’s defense has permitted six total points in the first three quarters of the three victories. Junior defensive lineman Jacob Green had another stellar game with 12 tackles, including one for loss. The Redmen have won their last two games by a combined score of 75-0 after a Week 1, 46-28 shootout win over Plainville. Smith Center took advantage of four turnovers against TMP last Friday. The Redmen, behind running backs Cale Rogers and Kaden Meitler and quarterback Thayne Benoit, finished with 366 yards. In the last 30 years, Smith Center holds a sizable advantage in the series against Norton, although the games are historically within 14 points. The Redmen have won eight of the last 11, but the squads have alternated the last six with a 32-0 Bluejay victory last season. The home team has won the last six meetings. In addition, Smith Center has won eight straight regular season home games dating back to a 36-14 Week 2 loss to Beloit in 2013. This game is going to be low-scoring and always high intensity, but Norton is still trying to find its identity offensively after Lively went down. Smith Center wins this one in the fourth quarter and continues the home winning streak in the series.